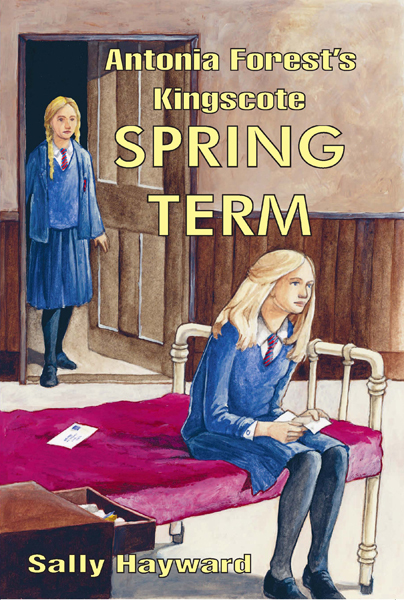 Antonia Forest’s Kingscote: Spring Term, by Sally Hayward | So This is School! ‘On Monday morning, much to the School’s surprise, Miss Keith said grace and then told everyone to remain seated as she had something of paramount importance to say. ‘I can’t remember a time when Autumn Term and End of Term were not sitting on the bookshelf,’ writes Sally Hayward in the foreword to her sequel to Antonia Forest’s series of books about the Marlow family, and it shows. She doesn’t just manage to capture Antonia Forest’s style, in language, plot and characters, but also courageously introduces some significant character developments of her own. The Attic Term, last of the school stories, finishes with quite a few dangling ends. Sally Hayward continues the uncertainty between Nicola and Esther, caused by Esther’s last-minute failure to sing Nicola’s solos, on just the right note – there are no angry quarrels, just cringeworthy and painfully realistic awkwardness. Similarly, the parting of Patrick and Ginty is, I think, entirely faithful to Antonia Forest. Indeed, Ginty’s storyline is probably Sally Hayward’s bravest and most controversial development. In The Attic Term, Mr Merrick comments that ‘I think it’s evens whether she goes to the good or to the bad. But I doubt if it’ll be very spectacular either way’, and a few lines later refers to Ginty as the Lady of Shalott: ‘”She has a lovely face, God in his mercy lend her grace”.’ In many ways Mr Merrick is right – Ginty does move a little towards the bad, but in no dramatic fashion. It’s fascinating to watch her gradual descent from shamed fibbing about the telephoning scandal of the previous term – which leads to difficulties in her relationship with Patrick – which leads to her reading his private letter to Nicola – which leads to her terrified lying in an attempt not to be found out, and eventually to the horrible showdown with her best friend Monica. It makes convincing and painful reading, and while I felt that Antonia Forest probably wouldn’t have taken Ginty down this route, there was, and still is, a continual lurking feeling that she just might have. She certainly wouldn’t have shied away from doing so if she’d wanted to; that much is evident from the boundary-breaking, trope-crushing originality of the Marlow stories. Tied into Ginty’s storyline is the final maturing of Ann – probably the part of the book I felt was least consistent with Antonia Forest’s style, simply because I can’t help the feeling that she didn’t much like Ann and that, in her mind, Ann would always be pretty much the same person. But I enjoyed Sally Hayward’s ideas about how Ann might change, and certainly the manner in which it happens is entirely plausible. Most poignant, I felt, was the moment when Lawrie, in careless irritation, asks Ann, ‘Why didn’t you go to the Chapel and ask Him?’ and Ann’s shocked realisation that that had never even crossed her mind. There are many other enjoyable elements to the book – Nicola’s singing lessons with Dr Herrick and her spiritual musings in the cathedral. Her resumed closeness with Patrick (I particularly enjoyed him persuading her, quite cleverly, to buy a new horse). The French Play that Miss Keith insists upon for Open Day is a challenge for both Lawrie in the starring role and Tim as producer. And Lawrie herself faces a personal trauma which she deals with in typical Lawrie fashion. Perhaps with a few too many italics and Marlow-isms, but altogether a worthy sequel to Antonia Forest and a really entertaining book in its own right. (With thanks to Clarissa of GGBP for providing the cover image). I’ve never read any Antonia Forest – now you’re making me want to, curse you! I do recommend Antonia Forest. All her books are remarkably well-written and original, quite out of the ordinary in the school story genre.